Harding County is a county located in the state of New Mexico. Based on the 2010 census, the population was 695,making it the least populous county in the state, and the 14th-smallest county by population in the United States. 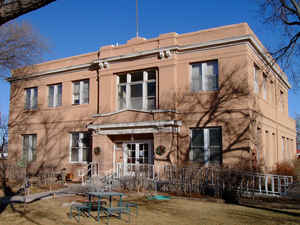 Its county seat is the Village of Mosquero. The county is named for United States President Warren G. Harding, and was created (from parts of Union and Mora Counties) on the day of his inauguration as President on March 4, 1921. The county got its name from President Warren G. Harding. 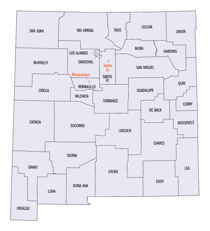 Harding County was created 4 March 1921. Mosquero is the county seat. The county got its name from President Warren G. Harding. 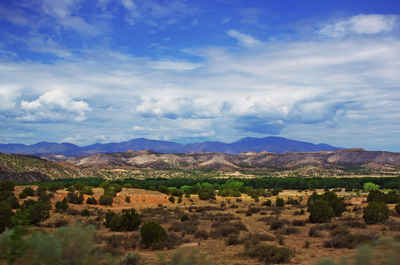 The county is famous for its large ranches and the rugged Canadian River Canyon. Increasingly of importance is chemical production for the oil industry. As reported by the Census Bureau, the county has a total area of 2,126 square miles (5,510 km2), of which 2,125 square miles (5,500 km2) is land and 0.4 square miles (1.0 km2) (0.02%) is water. It is divided between a high, nearly treeless prairie to the northwest (the southern limit of the High Plains), and a lower semi-desert rangeland to the southeast, by the eastern portion of the steep Canadian Escarpment. The Canadian River, in a deep and narrow canyon, forms the western border with Mora County; the southwest border runs along the edge of the Bell Ranch land in San Miguel County. The eastern part of Harding County is underlain in part by the Bravo Dome carbon dioxide gas field, which is commercially extracted.